Do Cats Like Dog Treats? 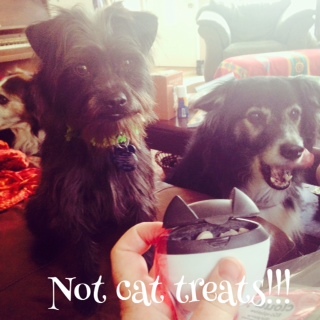 Maybe you don’t all know this, but dogs LOVE cat treats. Shoot, most cats barely eat their own food, much less dog treats. Our own Bosco, for example, will only eat one kind of cat food, a dry kibble, and nothing else. NOTHING ELSE. Crazy. But Liam? Liam was pretty serious about this Pig Ear. Yes, some cats like dog treats. Especially Jones chews. 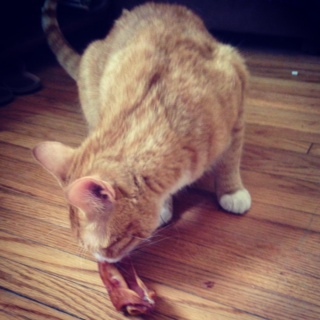 And Bert, Emma’s cat bro, likes Jones bones. So why would a cat like a dog treat? What is it about the treat? I’ve read that cat foods are higher in protein (meat) than dog foods, which is why dogs might pass up their own kibble for cat food. And Jones Natural Chews are mostly protein. Is that it? Wheezer Sticks are part of the beef esophagus. Dogs love ’em. Protein to the max. 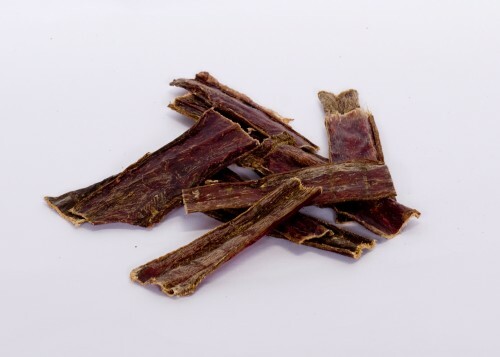 Treats can be made to be absolutely suitable for both cats and dogs, especially if they are made mostly from meat which is a natural food for both cats and dogs. This kind of treats is sometimes marketed just for cats or just for dogs, but this is just a marketing trick that helps manufacturers to attract cat lovers or dog lovers. So SHOULD you give your cat dog treats? Or dog food? Our last cat occasionally nommed on the dog food, but only once in a while. I think it was just part of an ongoing feud between the cat and dogs. He just wanted to drive the dogs nuts, knowing he’d touched their food. And once in a while, a nibble or two, it’s no big deal. But a steady diet of dog food for your cat won’t give it the nutrients it needs, just like a steady diet of cat food won’t give the dog what it needs. Though my grandmother only fed her Boston Terrier Meow Mix. Exclusively. Her Boston, Miss Beasley, looked almost exactly like this one. We don’t like to talk about that side of the family. I’d say yes, that your cat is welcome to eat any of the Jones Natural Chews that would appeal to it. The treats are, after all, 100% all natural, and 100% sourced and made in the USA. They’re primarily just meat and bones, so Jones will have the protein content that your cat needs, as a treat. No creature should be living solely off of treats, just like no child should be living solely off of cake and ice cream. These are cakes. Funnel cakes. 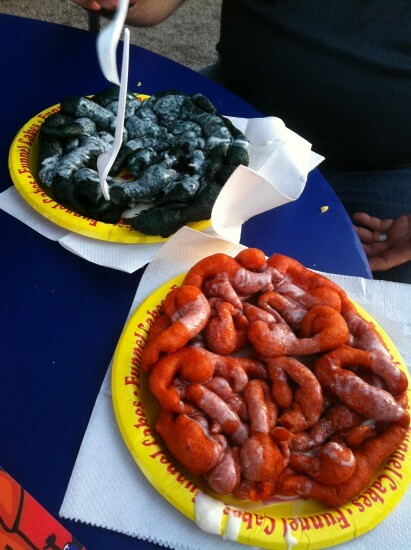 One looks rather like intestines. I don’t care what it looks like, a steady diet of this would be BAD. In fact, my guess is that Jones meaty treats are probably higher quality than a lot of cat treats, with fewer ingredients and better protein. The trick is whether or not your cat will eat them. Cats really ARE finicky eaters, after all. Let me know, will ya, if your cat likes dog treats? In fact, if you were at Blog Paws and took home Jones chews, did your cat sample any of them? I’m seriously curious. People ask pretty regularly if Jones makes treats for cats and the answer is no, but there are cats that like them, so I’m looking for the why of that. Finding all natural, made in the USA quality treats for cats seems to be a little more difficult than finding them for dogs. I’d love to hear what y’all have to say! I’d especially like to hear what Slim Doggy and Slim Kitty have to say. Oh! And if you’re looking for Jones, look no further than the local pet or feed store. Call around and ask. Head to the Jones retail page. And if you’re still coming up blank, pop over to Natural Dog Treat Shop to find the full line of treats!